I love granola. It’s a perfect carb to carry me through the morning’s first several hours, keeping hunger at bay and me focused on other tasks at hand. But a lot of store bought granolas include heaping amounts of sugars, preservatives and a plethora of oil. I’m not about that life. 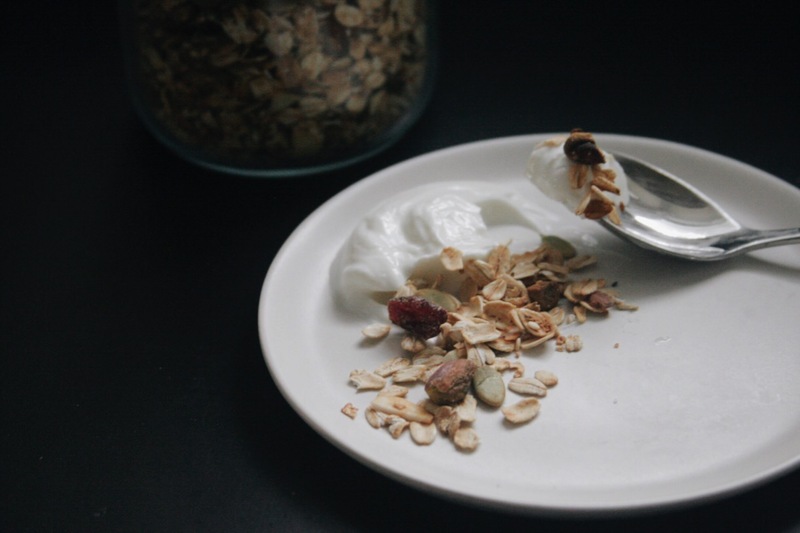 So one summer morning I decided just to make my own with the ingredients that I had on hand at that exact moment and made a granola I now keep on hand regularly. It is full of healthy fats, low in sugar, whole grains, and omega-3s! 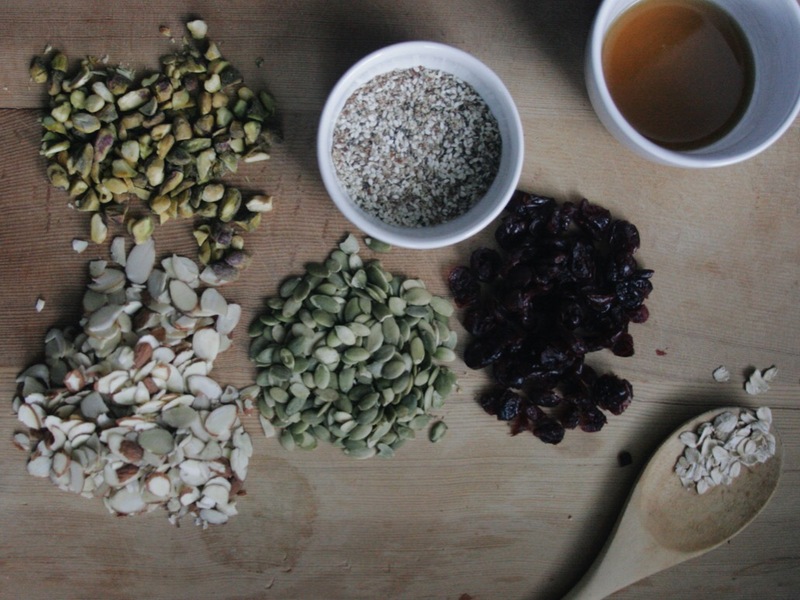 A little bit of granola goes a long way. A great addition to yogurt or alone with your favorite milk, kefir or nut milk and even served on top of fresh, warm grain-free pancakes with a light honey drizzle! Also, perfect for topping off sliced bananas. Preheat oven to 325 degrees Fahrenheit and adjust the oven rack to the center position. Line a baking tray with foil. If you need two baking trays that works, too, just try to put them side by side. 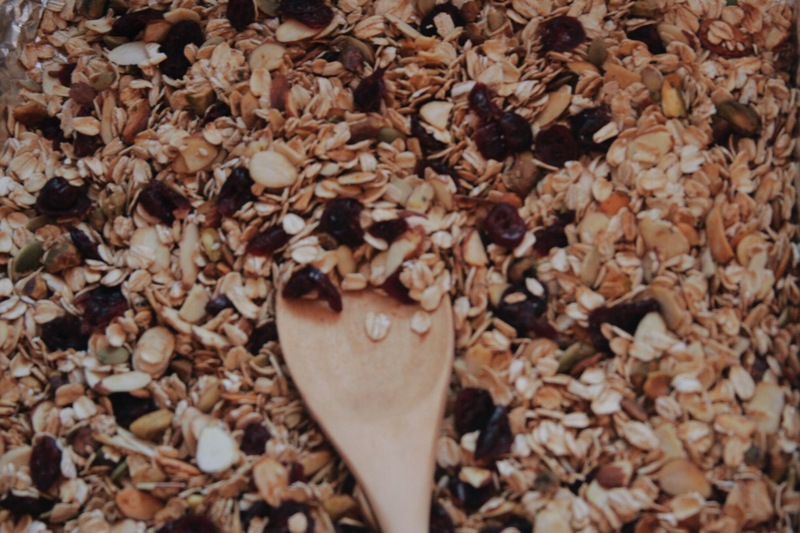 You will want to have a thin layer of granola so every part gets evenly toasted. In a very small bowl mix together honey, water, and vanilla extract. Set aside. 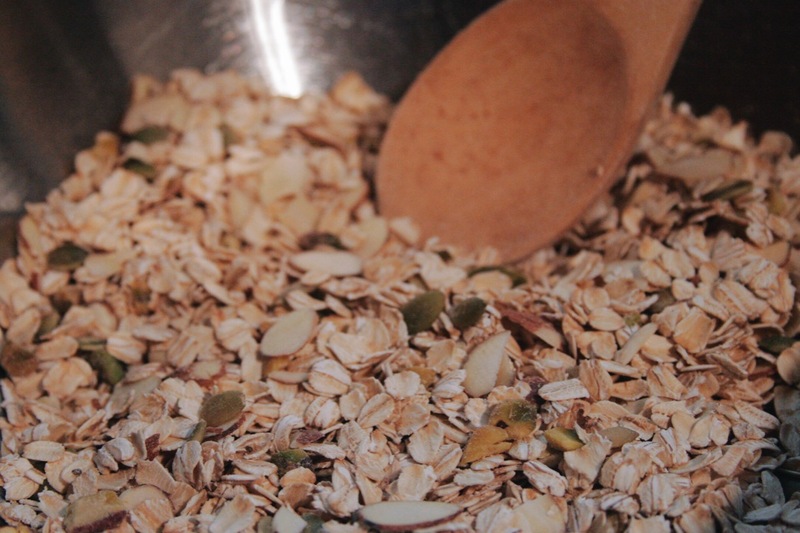 In a large mixing bowl mix together the oats, pistachios, almonds, pepitas, flax, chia, sesame and salt. Add the wet mixture to the dry mixture and stir well until fully coated and mixed. Everything will be very lightly coated, not sopping. If you have little ones this would be a great thing for them to help you with in the kitchen! Spread mixture evenly across the tray in a thin, single layer. Bake for about 15-18 minutes until evenly browned, stirring halfway through. You will be able to smell a toasty fragrance of goodness from you oven when they are about done. Let cool and stir in the dried cranberries. You can store in an airtight container for several months. This is super easy to make, customize and give as gifts. Have fun with your local, seasonal flavors. I like to prepare it before friends or family come stay with me at my home as an easy grab and go option. 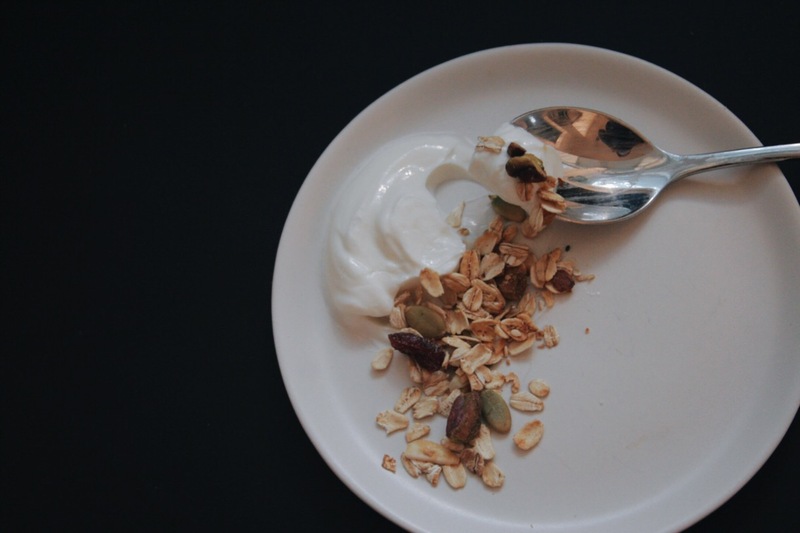 *If you want an autumnal granola replace the honey water mixture with 2 Tbsp. pure maple syrup, the vanilla extract with 1/2 tsp. ground cinnamon, all nuts with 3/4 cup chopped pecans and the dried cranberries with dried or freeze dried apple chunks (not rings). Although the dried cranberries would work well here, too! 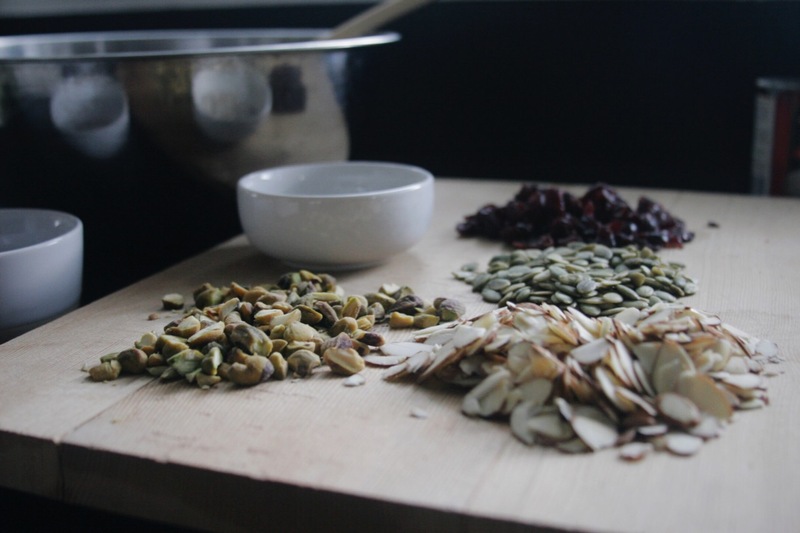 Makes 3 cups of granola or 12 servings.